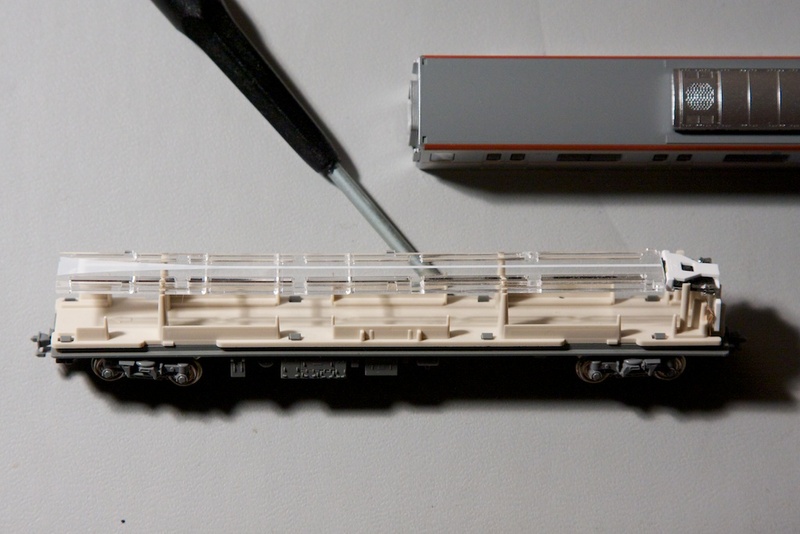 We've had a number of "how to light trains" discussions over the years, mostly focusing on specific problems. But we've never had a thread (as far as I can find) that worked as a FAQ/sticky on train lighting. So I'm starting this one as a repository for such posts. Hopefully we'll get enough content to make it a sticky. This is really intended to be specific to passenger car interior lights, but additional comments on head/tail lights won't be off topic. Let's avoid in-depth headlight lightboard rewiring discussions though, as we have other threads for that. I'll kick off with a quick recap of a bunch of basic info from other threads or general knowledge. And when I get a chance I'll add some info from my pages on Kato's LED lighting kits. 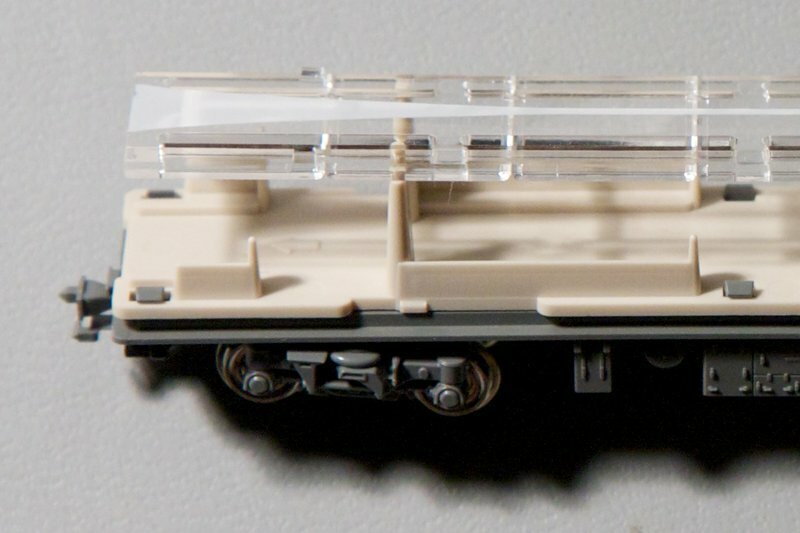 First, N-scale lighting is usually one light element per car (that's not guaranteed, and cab cars/locos wil possibly have more for head/tail lights). These can be bulbs, full-size LEDs, or surface-mount (SMD) LEDs. A bulb draws about 60ma (milli-amps, 1/1000 of an Ampere). A full-size LED typically draws around 20ma, but could draw less depending on the resistor used, or more if a "bright white" LED was used (some of those can be up to 60mA). An SMD LED often draws as little as 3-5mA, but those would be the colored ones used for head/tail lights. 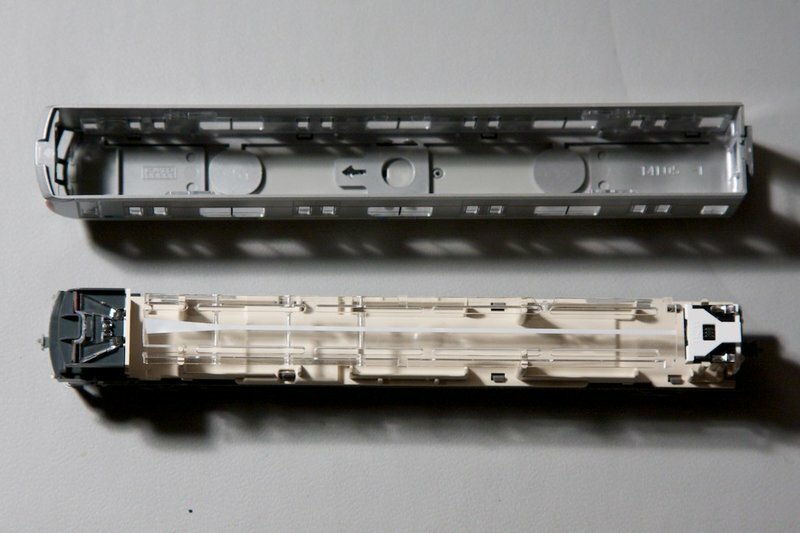 My experience with Kato's interior lights, which use white SMDs, is that their new V2 sets draw about 12-15mA per LED when powered on a 12V DCC system. I don't have as good numbers for their older ones, but I once estimated those at around 6-7mA each. So a lit 10-car passenger train of modern design can take about 150mA standing still (I have a train with Kato's V2 lighting that measured that much on DCC), and another 50-70mA in motion (so 200-220mA). An older train with bulb lighting might easily be 650mA, and with a less-efficient motor might top 1 Amp (1,000mA) in motion. And trains lit with larger LEDs could fall in the middle of that range. On DC, bulbs will light dim at low throttle, and get brighter at higher speeds (higher speed = more voltage). LEDs will be dark below a minimum, then very dim at first. Bulbs often look better on DC layouts as a result. Both bulbs and LEDs may be "too bright" at maximum throttle or on DCC (but "too bright" is subjective; some people like that look). Bulb lighting can be problematic with DCC, since decoders typically use full track voltage for accessory outputs, and DCC is always at "maximum voltage", so bulbs can produce a lot more heat than the designers would assume from a DC environment. This has been reported to even melt models in some cases. LEDs should work on DCC. There are some risks, since LEDs have a maximum voltage, and exceeding it will damage them, but train designers probably assume a typical HO power pack (18V or more) as their worst case, and while some DCC systems exceed 23V, most are similar to HO DC power. Kato told Don that it was safe to use their LED lighting (original) on DCC without a DCC decoder, but that probably assumed the 14V Zephyr (which Kato resells) as the maximum voltage. Bulbs aren't polarized, and a typical 16V bulb can be wired direct to the track pickups. LEDs are polarized, and on both DC and DCC will require a diode set or rectifier chip to convert the track power to their polarity. They also aren't designed for 12-18V use, and require a resistor to lower track voltage to their native voltage, which is often around 2 Volts (and more than ~5V will destroy an unprotected LED). Dirty track or poor pickups will make lights flicker. There are commercial solutions to that (circuits with a capacitor to provide power for a very brief time) or you can make the circuit yourself if you're handy with a soldering iron (I'll post some info on my circuit for that later). 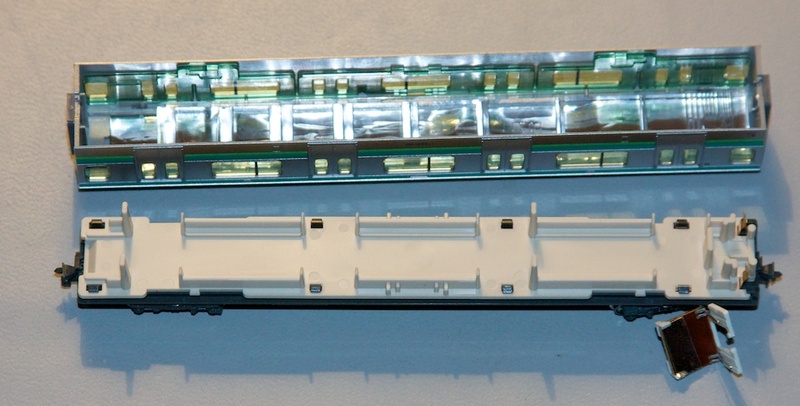 Several manufacturers make drop-in lighting sets for passenger cars, but not all trains are compatible (and some have more than one kind for different trains). I don't have experience with the non-Kato ones, so I don't have anything to post regarding them. And if anyone wants to post "which set is compatible with which train" lists, that would be cool. ... Several manufacturers make drop-in lighting sets for passenger cars, but not all trains are compatible (and some have more than one kind for different trains). I don't have experience with the non-Kato ones, so I don't have anything to post regarding them. And if anyone wants to post "which set is compatible with which train" lists, that would be cool. Yes, a list like that for Tomix trains would be a great thing. I've never been able to figure it out with the "wides" and "narrows" and so on. narrow are the models with the pick up holes at the very edge of model and the springs are roughly 5mm from the edge of the light kit. wide is about 1.5cm in from the body and same for the light there is about 1.5 cm of circuitry then the springs. I mention illumina in the what did you buy thread. these are identical to MA and very similar to tomix. As promised, info on the Kato lightboards. Kato has made at least four distinct user-installed car lighting sets. They also have some trains with pre-installed lighting. The earliest set, the Passenger Car Lighting Kit, model 11-201, used a different type of electrical pickup than the later ones, and was used in some of their older trains. This set, which used a bulb, is still available and priced at 400 Yen per car. The design is similar to the later ones, but not identical. I've never owned one of these so I can't provide more detail or pictures (but Hobby Search has a photo, do a search on Kato 11-201). Confirm beforehand if they KATO catalog, please contact our representative. Later Kato introduced the New Passenger Car Lighting Kit, model 11-204, with bulb lights. This used a standard mount built into the car, pre-installed underfloor brass strips that were fed power from pickups on the wheels, and a pair of slide-in "L"-shaped contact strips to route power up to the lightboard. The kit contained a lightboard, the two brass contact strips, a plastic diffuser that ran the length of the car ceiling to spread the light, and a bit of reflective tape to attach to the roof of the car. The lightboard was equipped with a bulb. / Kiha 40 series passenger car / car system 20/10 6300 Hankyu system / system / E2 system / E1 series / 100 series / 0 system / E351 series / 787 series / 681 series / 583 series / 415 series / 281 series / 281 series 11 If you are not sure whether possible, confirm beforehand if they KATO catalog, please contact our staff on hand attached to the vehicle, such as / Kiha 52 series. In addition to 11-204 (which contains a single lightboard) for 400 Yen, they also sell a pack of six as 11-206 for 2000 Yen. This is still in production, but I've never owned any so I can't provide photos. From pictures I've seen it appears identical to the later "version 1" LED set. This was followed by a LED-based version, part 11-209, for 700 Yen that was identical except for two things: first it used a white LED (a surface-mount one) and second there was an optional orange plastic clip you could attach to the LED if you wanted a yellower interior light (as if incandescent lighting, rather than fluorescent, were used). Again a six-pack is available, 11-210 for 3500 Yen. These too are still available. I'm not aware of any list of compatible trains, but most EMUs made since c. 2004 are likely compatible, although some (particularly Shinkansen and limited express models) are not. 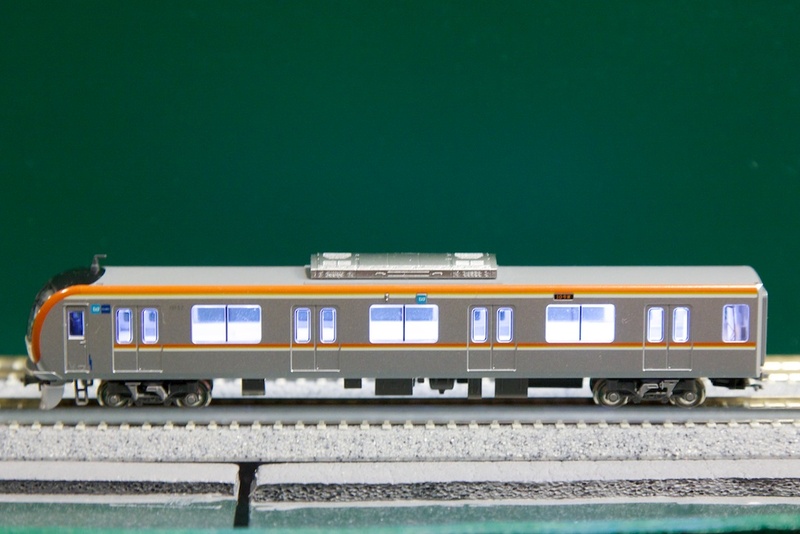 Usually the description of the train (on Kato Japan's site and on most online stores) will note compatibility if it exists. In all of these, except maybe the first, the diffuser was held loosely in place by clips under the roof, and posts on the car floor. It was also segmented, and segments could be broken off to fit shorter cars. One end of the diffuser was "rippled" and this end went near the bulb/LED. 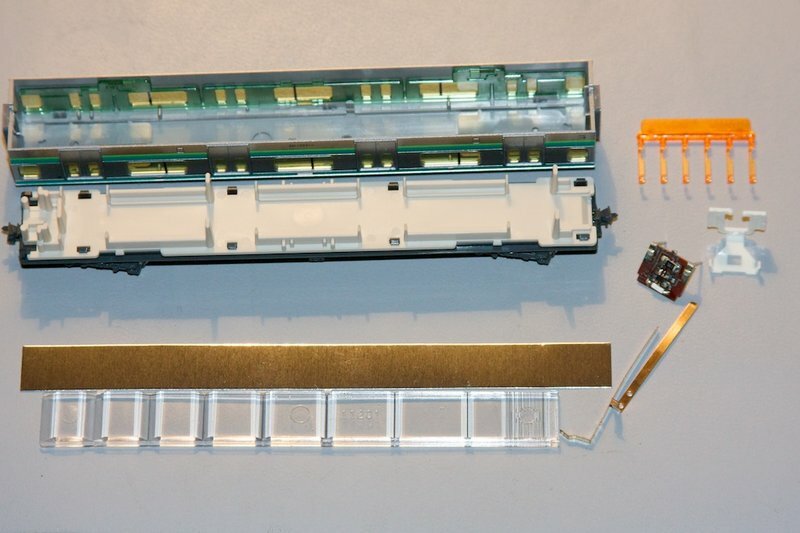 Photo 1 shows the parts set. 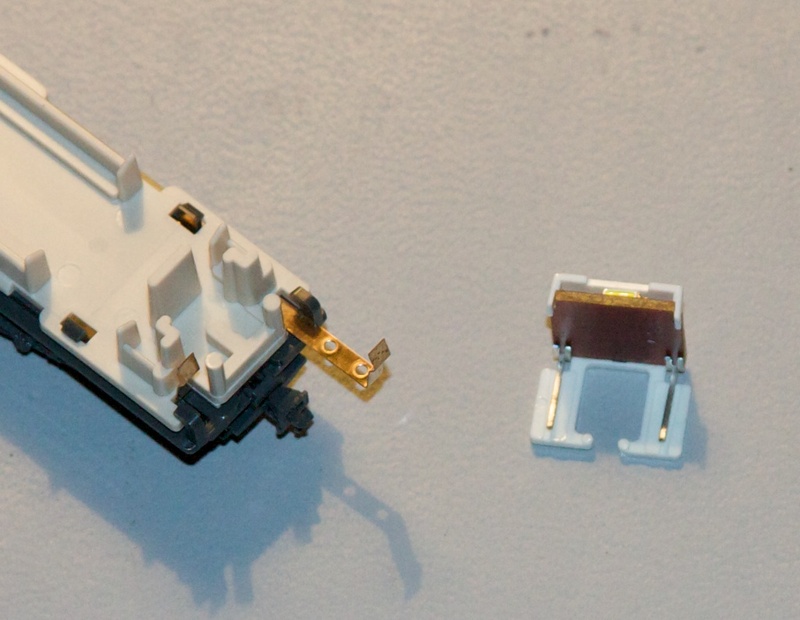 Photo 2 shows the inserted brass contact strips (one half out) and the lightboard (the LED is the pale yellow bar top center between the board and the white plastic). Photo 3 shows the mounting position, and the lightboard with a bit of tape stuck to the underside as per the instructions. Photo 4 shows a car with diffuser and tape installed in the roof, and the lightboard ready to install in the mounting. Photo 5 shows a lit car; this one has a painted interior, which tones the light intensity down and gives it a blue color; out of the box it's brighter and white. Photo 6 shows the diffuser (middle) flanked by two of the new "version 2" style diffusers. Another post on the revised LED lightboard will follow. In 2011 Kato introduced the "version 2" LED lighting set, 11-211, for 720 Yen, and a six-pack, 11-212, for 3600 Yen. These are similar to the previous versions, but with a new style of diffuser that eliminates the reflective tape, and a new style of interior mounting post. The new sets can apparently be used in cars designed for the V1 LED set, but the converse is not true. You can't mount a V1 set in a car designed for V2 without cutting the top of the in-car posts off, as in the new board these narrow to rods that fit into slots on the diffuser, to more securely hold it in exact position. Cars produced from late 2011 (starting with the Subway cars) are being made for the new sets, although re-runs of older cars may still be designed for the earlier ones. And again, not all cars are designed to be compatible with lighting kits. One thing that isn't obvious in the instructions is that the diffuser has a white part on one side that broadens out in a fan shape at one end. The fan part goes away from the LED, not adjacent to it. And this is also the part to snap off to shorten the strip. Also, while you can still snap it, the perforation isn't as deep, and cutting pliers will do a better job. The lightboard in these is now jacketed in a black insulating plastic and pre-installed into the white plastic clip (in prior sets, you had to put the clip on yourself, and this was one of the harder parts to get right). It's unclear if there are any differences, although it appears to be brighter and take more power. 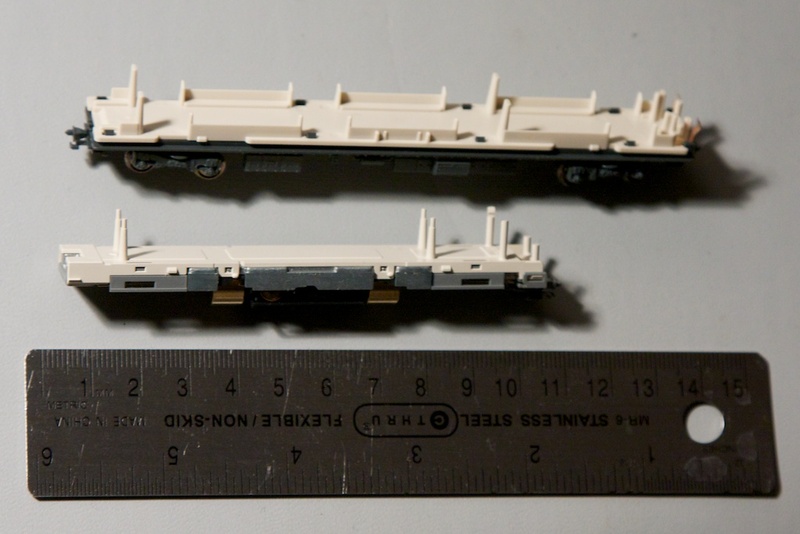 Measurements I've made suggests it's using about 12-15mA per car, where the "version 1" LED set used about half that. Photo 1 shows two cars, a normal EMU (top) with the old style support posts that end in a flat oval, and a subway car (bottom) with the new style that end in a pin-shaped rod. Photo 2 shows the diffuser and lightboard installed in a car. Photo 3 shows them in a cab car, with part of the diffuser removed. Photo 4 is a close-up of the mounting post with diffuser. 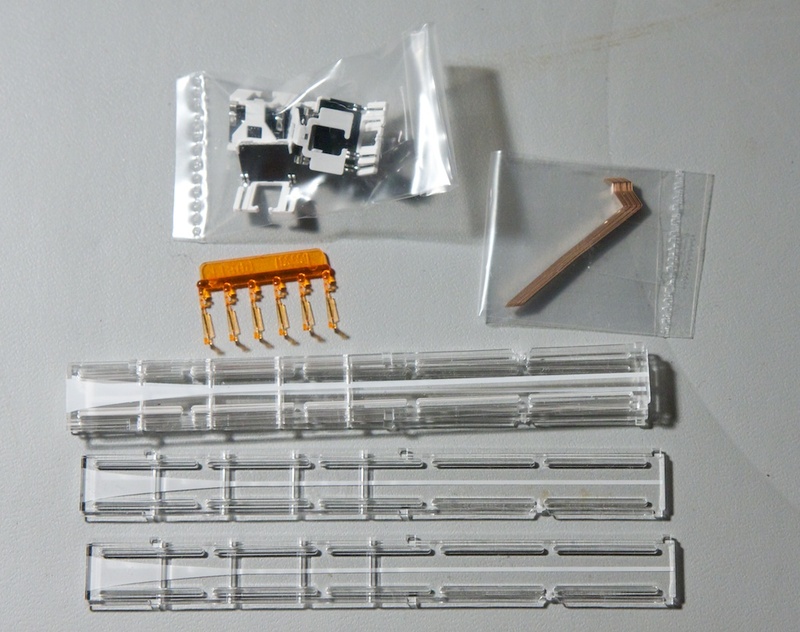 Photo 5 shows the set of parts in a six-pack. kens great post. just want to add not all older models reqire chopping to get the new v2 set. some just dont work at all because the roof shape is wider and they will not hold up. E5 for example has this issue. i have a spare of the MA typea and a spare of the kato to test which work or not same as my illumi from fmokei now. I have updated a video with the MA fuji set With Illumi lighting Alternative. 4 cars upgraded. Note these lights are 10 for 5000 yen where as tomix is 6 for 5250 yen in hs as an example. Works out much more econimical and they are from what it looks identical to the MA unit. Even the tomix ones look Almost Like it. About this video. Don't be alarmed by the difference in brightness. I assure you they are all very identical. The last 3 carriages were sleeper carriages and have bunk beds and walls reducing the brightness effect. This actually makes it look like there are smaller lights in each room in the carriage in person. The first carriage is the dining so there is nothing blocking the leds from lighting up. As promised a MA vs illumi offering alternative MA is the left and Illumi right. The illumi is longer in size there for more suitable for shinkansen. However as the video will show they light up at different voltages and the MA is brighter(shouldn't matter in dcc anyway). Though Some may feel the not so bright is much better anyway. Still much worth it for the price difference. I don't have a tomix lighting kit atm but am ordering some soon will update later so we can have a 3 way comparison. According to this spanish-language blog it can be done, although some modification of the diffuser beyond the usual shortening is required ("cutting three notches") to make it fit. I have an E5, but I've only added the cab/motor decoders to it so far, not done the lighting. I'll have to give it a try. Update: some days my memory plays tricks on me. I'd found the above site through Quinntopia, and for some reason it looked familiar. It wasn't until this morning that I realized the reason was that the author, Rintintin, has been posting here, and in particular has posted about his E5 work on the E5 thread in Announcements. Duh! Sorry about that, Rintintin. I should have remembered that. Here's a picture of an experiment. Installed correctly, are Kato White LED (11-210) Interior kits. Each Coach, utilizes a different arrangement for intensity and color comparison. One uses no diffuser, middle one uses the orange filter, and the last uses the orange filter plus 2.5 mil thick 1/2" wide dielectric tape above the lens to create a totally different theme. Which do you like for a 1941 passenger train and which do you prefer for a modern day train? That orange filter doesn't seem to help much at all, but it may be that the focus is out. I was reviewing your photo and looking at the ambience of the car interior. The electrical tape seems to be the most effective and I'd even be using it for the rather dull lighting that was in the 583s and 183s in the mid 1980's. Top job. I was going to mess around with resistor to try to achieve the same effect but, bugger it, the tape should do the job just fine. Yes, that Spanish blog is mine, I hope "Google translator button" could help you to understand what I wrote there, more or less... But photos are very explanatory, I think Hope it helps you. That orange filter doesn't seem to help much at all. Thanks! The orange filter just reduces the sting of the white led and reduces some of the blue. I can only guess as to what the lighting looked like back then. The super filter at least creates more definition. I get a chux sheet and cut it to be no more than about 1.5 - 2cm wide and enough length to cover a rail. Then I apply some wheel cleaning soloution to the chux and just run the trains normallly around the track. Each time they pass the dirt will loosen and clean off, you will need to have the chux held down on each side and move / replace it sometimes if there really dirty. It will also clean the motor wheels at the same time. It has to be not too wide though so it doesn't loose power when the motor car passes over and a decent speed. Alternatively you can just roll the carriage back and forth by hand at that piece of track. Though i usually just let the train run so i can walk off and do other things. one way to clean the wheels is to put a piece of folded paper towels over a piece of track and soak the paper with your cleaner then run the car back and forth over it by hand pushing down some. keep doing it until there is no black lines left. doesnt clean the other parts of the pickup chain. all wheel pickup is the bees knees, but unfortunately its only on a few trains and the trucks are not cheap and not readily available to redo other trains. I use a plastic plate and spill enough rubbing alcohol into it to create a puddle around the trucks. Millimeter deep. Let cohesion be your friend. It won't get into the bearings. Roll now and again and in 10 minutes time to roll the trucks dry over a paper towel covered track. Use a piece of flex track for this. Repeat as necessary. FYI - the new style Kato chassis (I.e Dr. Yellow) have forward support posts to stabilize the lighting decoder. I spread the decoder legs for better contact and stability during my installs. Yet another alternative to cheaper interior lighting other than F&Mokei's illumi lights which I adore. Seems to be a Tam Tam exclusive, somewhat like the illumi. Now seeing more illumi on other suppliers such as HS etc but still yet to see the Torm elsewhere..
Looks neat! Can work for Kato made trains too! Doesn't look too reliable on curves and could even short on S curves or turnouts. 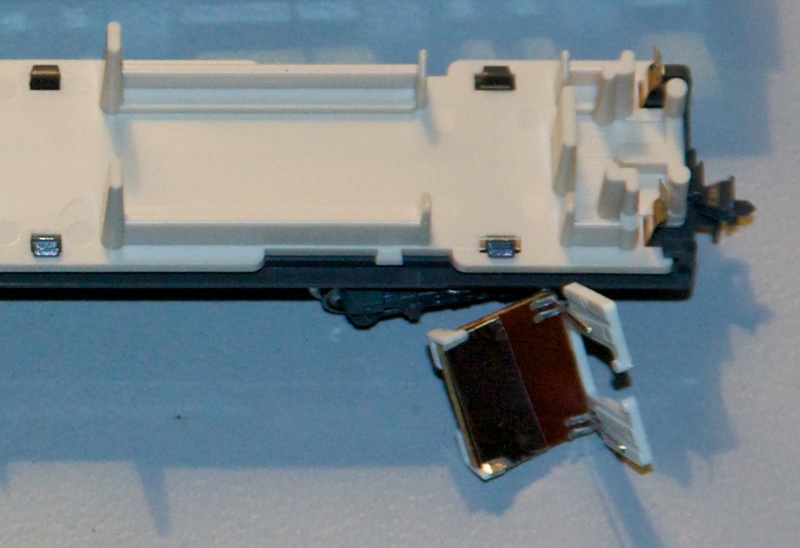 Adding a standard 2 pin connector with plastic spacers could make it work. That's very interesting. Mr Martijn and I were discussing such a problem in Chat a couple of weeks ago. Very cleaver design! Looks like it could take some fiddling to get adjusted just right for full movement as KVM noted. KVp it might have been me you saw talking about using neodymium magnets for power coupling as I've been playing with then to hold buildings in place and discovered they sow little or on surface resistance across a coupled pair so the idea was to use them to transfer lighting power as well to avoid hacking extra dangling wire and plugs or having to mount an extra plug system (magnets are great for placement as so easy to glue in place.) trick is attaching the wires. I've been meaning to experiment to see if they can be soldered to wires or not. Other ideas were to use conductive cement to attach the wire as it would not receive much stress on the joint. This concept might work for power coupling but smallest I've seen easily available a are 1mm x 2mm and those are big in n scale and hold quite well, so stress pulling apart would be high. With a pair also there would be the problem of getting enough wire flex to allow the couplers to take curves. Maybe someone makes like 1x1mm ones that would just glue to the end of the wire. Not sure if micro cables and plugs would work between n scale cars. Iv fiddled with many of the micro plugs out there and they require a fair bit of n scale space (ie 2-3mm x section and 4-6mm long for the pair so 2-3' scale) which is big in the space needed and the pressure needed to couple and uncouple is pretty high so you would need to do it with a couple of pairs of tweezers between the cars. Also all the fine wires out there over the short distance needed to hold the plugs out there will be quite stiff actually. The would need to be attached as far back in the truck as possible to give the most free wire play to flex. A little late, but better than never right? I also thought a list of Narrows and Wides would be great especially for Tomix since they usually do not list if they require the Narrow or Wide type, unlike MicroAcce models which are listed on the box. To start the ball rolling, here's my first list of the models which I have. Unfortunately I wouldn't be able to provide more information as to models which I do not have, but it's a good start to this list and hopefully many others can add on so that we can have a nice comprehensive list for all to use. Please also make amendments if I have been mistaken on some. Please add on and keep the list going! Thanks! anyone know whats involved with magnetic power? example the magnetic power chargers could small magnest be bult at car ends to have same effect? example sitting in the diaphragm? I thought about the video overnight. The two wires are round sections. The cross sectional area of wire in contact is minimal. It might work for a car or two, but you couldn't rely on power from 3 or 4 cars away, I don't think. In the meantime, I will look for a better solution. Yep you could do that with the diaphragms, connecting with magnets, even do it with a copper connector in front of it on top and bottom of the diaphragm for two power contacts. The only thing is you would need a movable diaphragm mechanism like the kato diaphragms to allow the car swing. Not sure I'd the tomix rotating diaphragms would give the proper swing if they were attached to each other with the magnets as I notice the slide around as thy go around curves. Maybe ill experiment with this I think I have a package of kato 500 diaphragm spares. Would just need to shave off the little clips. If more holding power is needed you can use barrel magnets instead od the disc magnets, but 2 1x2mm magnets clip pretty tightly to each other. Could design up a little plug that fit into the inside of the diaphragm coupler that held the magnets in place. Then just solder or conductive glue the inside ends of the magnets directly to the wires. 3d print the holders for 10 cents each and 10 cents of magnet for each end. Not as much problem with the wire stiffness as the wire could travel back a bit into the car to give it enough reach to flex some. It's only runs with very short bits of wire where you won't get a lot of flex and could bind things up. This proved true when I was playing with soldering wires right onto the bandai truck power feeds that there is no pickup easily done in the carriage floor. I could get enough flex in the 30gauge wire if I had 15-20mm play to do the 6mm swing w/o effectively binding the truck movement. Hmm now thinking of how about a diaphragm that would be a bit smaller than the standard door end in most regular train models. It would have a ridge on the inside end to keep it from being pulled out of the car and have a bit of play to swivel around some. Then a little retaining ring that fit around the outside portion of the diaphragm so that it had a couple of mm play in and out of the car but could not totally fall back into the car. Then do the Kato coupler idea above in that. Might work w/o the regular car coupler but if too much slinky play (like you sometimes see on rapidos with long springs w/o stops) if not just use the regular car coupler for the coupling and the diaphragm is just to carry power and give nice coupled diaphragms. Something else to fiddle with! Ill try to play with wire connections to the magnets tonight and see how viable that is.